The Kingdom of Thailand lies in the heart of Southeast Asia. It is surrounded by the countries of Myanmar, Laos, and Cambodia, with Malaysia to its south. 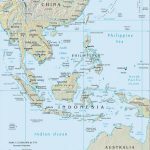 It is the only country in Southeast Asia that has never been colonized. Bangkok is the capital city and the center for industrial, commercial, political, and cultural activities. It is also the seat of Thailand’s Royal Family. King Bhumibol Adulyadej has ruled for more than 63 years. He is the longest reigning Thai monarch and the longest reigning current monarch in the world. Phuket Island, in the Andaman Sea, is the largest island in Thailand. It is connected to the mainland via the Sarasin Bridge. Chalong, in the southeast, is the starting point for most Phuket-based diving. The gorgeous Phi Phi Islands, along with a number of other dive sites, are easily accessible from Phuket. Expect beginner to intermediate level diving with walls, caves, wrecks, corals, lots of tropical fish, leopard sharks, and more. Further away are the Similan & Surin Islands. These world-class dive areas offer thriving reefs, lush corals, impressive sea fans, and an incredible variety of marine life, including large pelagics such as manta rays and whale sharks. Some divers choose to stay in Khao Lak, on the west coast of mainland Thailand, in order to enjoy day trips to the Similan Islands. Live-aboard trips are available from both locations. 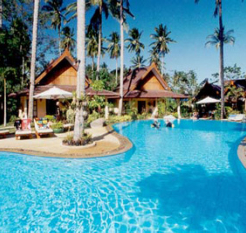 Khao Lak, on the west coast of mainland Thailand, is just a 1 hour drive from Phuket International Airport. Sea Bees Khao Lak provides day trips to the Similan Islands, which are only reachable via live-aboard from Phuket. The dive center, located at Palm Garden Resort, features a customer service desk, an equipment sales area, equipment rental & servicing, and air-conditioned classrooms. A full range of PADI courses is offered. Day trips to the Similan Islands and Koh Bon are serviced by the MV Stingray (left), a custom catamaran. The Stingray features an expansive dive deck, a comfortable salon, an onboard galley, and a large sundeck. The boat departs between 8am and 9am. You’ll enjoy between 2 and 4 dives depending on the day’s itinerary. It takes about 2 hours to reach the Similan Islands and about 2 1/2 hours to reach Koh Bon. The onboard chef will prepare a European breakfast for you to enjoy on the way. Lunch is served after your first dive, and fresh fruit after your second. Can you imagine a more heavenly day? The MV Runaway services trips to the Boonsung wreck. This elegant teak wood boat features parquet flooring, a downstairs salon, a covered sundeck, and an onboard Thai chef. Live-aboard trips to the Similan Islands, Koh Bon, Koh Tachai and Richelieu Rock are serviced by the MV Genesis I, also owned by Sea Bees and operated out of Khao Lak. Located near Phuket’s central harbor in Chalong Bay, Sea Bees Diving has been leading dive expeditions for over 12 years. The dive center features a customer service counter, an equipment sales showroom, equipment rental and servicing, and a tank service and filling station. The schooling center, located just a few minutes away at Palm Garden Resort, offers multi-media air-conditioned classrooms as well as a 3m deep training pool. A full range of PADI and SSI courses is offered. Day trips are serviced by the MV Excalibur II (left) and her sister ship, the MV Aragon. The Excalibur II features a large dive deck with separate gear storage for each diver, a diving platform with two freshwater showers, freshwater rinse tanks, a wetsuit drying rack, two shower cubicles and a western-style toilet with sink. Additional features include an equipment storage room on the lower deck, a sink & tables for camera equipment, a 220v battery charging station, a comfortable salon with two sofas, storage, and power sockets, a galley with onboard chef, a party deck with bar, bartender, tables and seating, and a sun deck. The MV Aragon offers all the features of the Excalibur II plus 12 bunk beds divided into 6 compartments on the lower deck to allow for short overnight trips to Hin Daeng and Hin Muang. Day trip sites from Phuket include Shark Point, Racha Noi, Racha Yai, Anemone Reef, King Cruiser, and Phi Phi Island. Transit times vary from 1 hr, 30 min to 2 hrs, 30 min. Live-aboard trips to the Similan Islands, Koh Bon, Koh Tachai and Richelieu Rock are serviced by the MV Marco Polo, also owned by Sea Bees and operated out of Phuket. Day trip boats depart between 8am and 9am. You’ll enjoy 2 to 4 dives depending on the day’s itinerary. The onboard chef will prepare a European breakfast for you to enjoy on the way. Lunch is served after your first dive, and fresh fruit after your second. Can you imagine a more heavenly day? This site is centered around three rocky pinnacles, the largest of which breaks the surface. The reefs are covered with anemones, sponges, soft corals, and gorgonian fans. You’ll see leopard sharks resting on the sand below. Other common sightings include sea snakes, trevally, giant barracudas and morays. This uninhabited tropical island offers great sites for experienced divers, as well as shallow bays for beginners & snorkelers. Large granite boulders covered in soft corals and feathered stars attract colorful reef fish and gentle pelagics. Manta rays, sting rays & whale sharks are commonly seen. This untouched tropical island boasts hard and soft corals, feathered stars, puffers, lionfish, and a wide variety of reef fish. Also keep an eye out for leopard sharks, blue spotted sting rays and garden eels. The focus of this site is a submerged rock that is covered with anemones & colorful soft corals. Lots of tropical fish, clownfish, leopard sharks and lionfish. This car and passenger ferry boat sank on May 4, 1997. Now it is home to one of the largest lionfish around, as well as numerous camouflaged scorpionfish. Also look for nurse sharks, schools of trevally, turtles, crabs, great & yellowtail barracudas, mackerel, surgeonfish, rabbitfish, fusiliers, lionfish, cuttlefish and more. Known for their limestone cliffs rising from the water, the Phi Phi Islands boast walls covered with colorful soft corals, as well as plenty of caves and caverns to explore. You’ll see green and hawksbill turtles, black and white banded sea snakes, angelfish, black tip reef sharks, lionfish, leopard sharks, scorpionfish, and so much more. There are approximately 15 dive sites in this area. The Similan Islands are composed of nine islands northwest of Phuket. Gigantic boulders above and below the water line provide amazing scenery and exciting swim-throughs for divers. Expect crystal-clear water, great visibility, thriving reefs, lush corals, impressive sea fans, and an abundance of marine life. 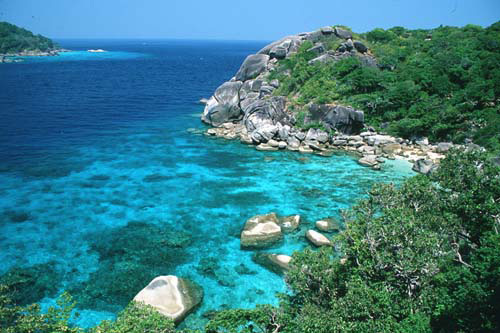 There are 20 dive sites in the Similans, as well as shallow bays and white sandy beaches for snorkelers. This is a world renowned site and one of the best locations for spotting whale sharks in the world. It is a submerged rock surrounded by pinnacles covered in corals and sea fans. Seahorses, shovel nose rays, morays, lionfish, turtles, and schools of bannerfish, tuna, barracuda and trevally are common sightings. At night the site becomes an excellent macro dive with numerous varieties of crabs & shrimp on display. 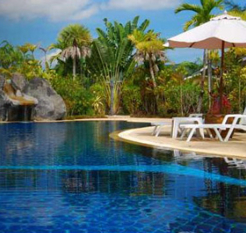 Located in picturesque Khao Lak on the west coast of mainland Thailand, the relaxing Palm Garden Resort is conveniently positioned to allow land-based day trips to the Similan Islands and Koh Bon. The resort, completed in 2005 and just an hour drive from Phuket International Airport, consists of 10 double bungalows (20 rooms) situated around a pool amid palm trees and lush foliage. Enjoy the lush tropical surroundings from your large terrace or relax in a lounge chair next to the water. The pool is not only great for sunbathing and paddling, it is also perfect for learning to dive or for taking that advanced course that you’ve been thinking about. Sea Bees Diving is located on-site. A cozy restaurant offers delicious meals and tropical cocktails from morning ’til night. The Palm Garden Resort invites you to relax and enjoy the tropical nature on your well deserved holiday. 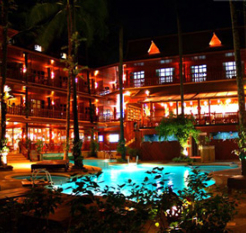 Palm Garden Resort is located only five minutes walking distance from their very own dive center, Sea Bees Diving, in a very quiet area of Chalong Bay. The resort is situated over 600 ft back from the main road, and is surrounded by palm trees and luscious greenery. Some of Phuket’s most beautiful beaches are only about a 10 minute car, motorbike, or local bus ride away. Also within walking distance are supermarkets, shops, bars and plenty of restaurants offering a large variety of Thai and International cuisine. 12 duplex bungalows house 24 rooms total. All rooms are equipped with a double or 2 single beds, a/c, fan, hot water showers, minibar, wireless internet, TV, safe, battery charger, wardrobe, and separate drying room for towels & dive gear. The bungalows are situated around a large swimming pool with a waterfall and jacuzzi. Enjoy the lush tropical surroundings from your large terrace or relax in a sun bed next to the water. The pool is not only great for sunbathing and paddling, it is also perfect for learning to dive or for taking that advanced course that you’ve been thinking about. A cozy restaurant offers delicious meals and tropical cocktails from morning ’til night. Additional resort amenities include diving expeditions with Sea Bees Diving, massage services, a tour counter, taxi and laundry service, moped or car rentals, and yoga classes. The Palm Garden Resort invites you to relax and enjoy the tropical nature on your well deserved holiday. Although this boutique resort is just 300 ft from the beach and a 2 minute walk from the excellent nightlife & shopping of Phuket’s Patong Beach, the naturally kept grounds give the resort the feel of a private oasis. Allow yourself to be waited on hand and foot as you lounge by the pool. Choose from a Superior Room, a Deluxe Room, a Deluxe Suite, or a Pavilion Room. Superior Rooms (left) feature a king or two twin size beds, individual air-conditioning, minibar with refrigerator, separate toilet & bathroom, hair dryer, electronic safe, satellite TV, IDD telephone, wireless internet, coffee maker, daily newspaper and room service. Deluxe Rooms (below) also enjoy private furnished balconies. Deluxe Suites offer a comfortable living space in addition to the amenities above. This may be the perfect spot to get out your laptop and take advantage of the resort’s free wireless internet. In the mood to splurge? Why not book a Pavilion Room with your own private Jacuzzi? This internationally renowned restaurant located at Mom Tri’s Boathouse boutique resort on Kata Beach features fine French & Thai cuisine and a wine cellar that boasts over 750 labels. Choose to dine on the beachfront terrace or in the stylishly appointed dining room. Reservations recommended. Another famous restaurant is Baan Rim Pa located just north of Patong Beach. The menu features Thai dishes formerly found only in the Grand Palace of Thailand. The restaurant also boasts outdoor terraces overlooking the bay, a piano bar, an award-winning wine cellar, a cocktail bar, and a cigar bar. Be sure to make a reservation. This stylish expat hangout offers tasty fusion Thai cuisine. Located just north of Phuket town, overlooking Phuket Boat Lagoon. If you’re in need of some pizza or pasta, head for this great restaurant in the center of Phuket town! Go hiking in Khao Phra Thaeo National Park (Northern Phuket). This park contains the only remaining virgin rainforest on Phuket. Add a stopover in exciting Bangkok! 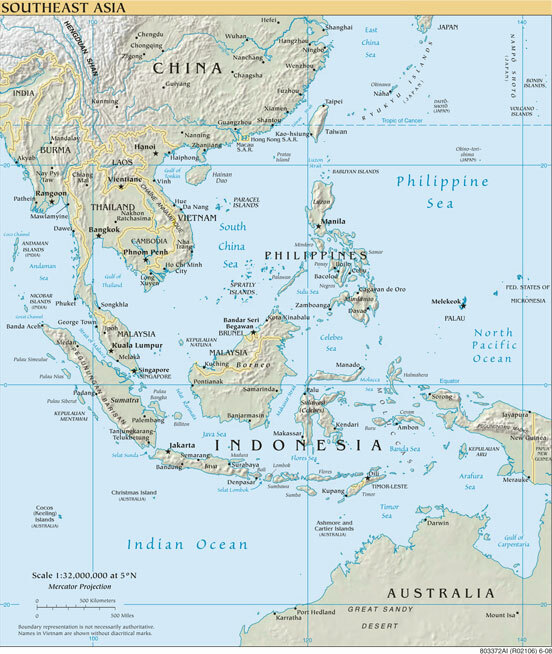 Thailand is located in Southeast Asia. It is surrounded by the countries of Myanmar, Laos, and Cambodia. To the south of Thailand is Malaysia. From Los Angeles, the flight to Bangkok, Thailand will be approximately 18 hours. From there you will take a 1 hour and 25 minute domestic flight from Bangkok to Phuket. The currency of Thailand is the baht. Paper baht comes in denominations of 10 (brown), 20 (green), 50 (blue), 100 (red), 500 (purple) and 1000 (beige). Coin baht comes in denominations of 1, 2, 5, and 10. There are 100 satang in 1 baht and two satang denominated coins that are used: the 25-satang coin and the 50-satang coin. ATM machines are located almost everywhere, and most establishments accept major credit cards. The main language is Thai. Other languages spoken are Chinese and Malay. English is widely spoken in Bangkok and other major cities and tourist destinations. The electricity in Thailand is 220 volts, 50 cycles per second. Most receptacles only have 2 holes. However, newer establishments offer the third prong. For assurance, it is advisable to bring a converter or adapter. Please check with the airline(s) you are flying with for international and domestic luggage requirements and restrictions. What airlines fly to Thailand? International flights are on 747’s and A380’s. Depending on what airline you are flying with, your connecting flight to Phuket will be on an A340 or an A320. The 747’s and A380’s have a 3-4-3 configuration. The seats are ABC-DEFG-HJK. A320’s and A340’s have a 2-4-2 configuration. The seats are AC-DEFG-HK. While the water can get warm enough to go without, we recommend divers wear a 3mm wetsuit for protection. Boat rides to the dive sites take between 1 hour and 30 minutes & 2 hours and 30 minutes. Sea Bees boats depart between 8am and 9am. You’ll enjoy 2 to 4 dives depending on the day’s itinerary. The onboard chef will prepare a European breakfast for you to enjoy on the way. Lunch is served after your first dive, and fresh fruit after your second.